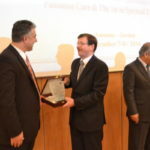 Muslim Spiritual Care Services introduced the concept of spiritual care to Amman, Jordan in the first of its kind conference that focused on Palliative Care and spiritual care. The two-day conference was held at the University of Jordan in Amman/Jordan on December 7-8, 2016. The main themes of the conference included spiritual therapy, spiritual assessment, and meaning of spiritual care. Additional themes included symptoms and pain management, end of life issues, home care, psycho social aspect of palliative care, and complementary therapies. The conference was organized by the Arab Society of Palliative Care and co-sponsored by the School of Nursing at the University of Jordan. The minister of health in Jordan Dr Mahmoud Al-Sheyyab​​ addressed the audience on behalf of Princess Mona Al-Hussein. Could you send me the content of the presentation to benefit from it in my research which is talking about spiritual care by listening to recitation of the Holy Qur’an in Jordan?.